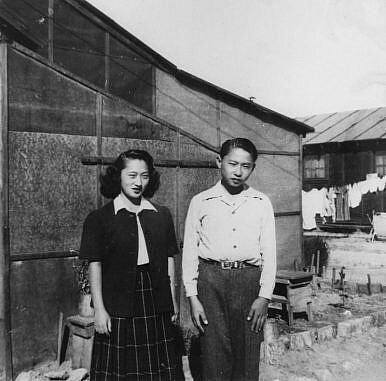 A couple at the Tule Lake Relocation Center in 1945. As discussion of internment rises in America, the most fortified city in the Americas during WWII risks being forgotten. The sign is followed by a series of broad, empty avenues, past shuttered hotels and clapboard, single-patron restaurants. In the middle of summer, foot traffic is light. A water tower peers, peels in need of new paint, casting a sundial shadow in your path. Low, pale clouds scrape overhead. A lone kestrel sloops past. You slow down, and pull into a parking lot for the local National Park Service ranger station. There, behind the fence, is a sawed-off guard-tower: a windowed box, bordered by a wooden walkway, with a mannequin silhouetted inside, staring out. Underneath lies degraded, prone farm equipment. Rusted shovels. Crippled tractors. Trowels, in need of handles, in need of hands. The lot is scattered with these tools. A junkyard, in all but name. But these items aren’t some scrap heap, left by those forgetting pasts in small-town America. These were tools — that was the guard-tower — used in Tulelake’s eponymous internment camp, where nearly 20,000 individuals of Japanese descent were forcibly held during World War II. Most of these individuals were American citizens, witnessing their constitutional rights cratered by fear, coaxed by officials’ undiluted racism, and greed, with ethnic white neighbors envying the productive lots, the productive lands, these Japanese-Americans maintained. Of the ten internment centers scattered from Idaho to Arkansas, Tule Lake — the camp spelled slightly differently than the nearby town — was the largest. Barbed wire scarred the camp’s perimeter. Tanks prowled the grounds. Guard towers — rifles and machine guns live — watched over. All told, the camp at Tule Lake, according to researcher Michi Nishiura Weglyn, was “undoubtedly [the] most fortified city … in the Western Hemisphere” during WWII. Now, with the 75th anniversary of President Franklin D. Roosevelt’s executive order to herd 120,000 American citizens and residents along the West Coast into his “concentration camps” approaching early next year, Tule Lake risks being flattened, forgotten. Excised from collective memory. Gouged by locals who — after bulldozing the camp’s cemetery, the graves of those interned churned for a local landfill — are now looking to erect a wall through the camp’s remains. All of this, during an election season in which the interest in — and support for — policies of internment rage, redound through presidential platforms. Indeed, if those who’d reinstate policies of ethno-religious cleansing have their way, that 75th anniversary of Roosevelt’s order could come during the first month of the presidency of Donald Trump — a man whose supporters have not only espoused far more support for the policy of Japanese-American internment than his competitor, but of any candidate on either side of the recent primaries. Ask those who survived Tule Lake for comparisons of the rhetoric following Pearl Harbor and that which we’ve seen over the past few months, and the responses are stark. “Those statements by Trump concerning preventing all Muslims, American or non-Americans, from entering the country is very reminiscent of what happened during WWII,” Hiroshi Shimizu, president of the Tule Lake Committee, told me. In a December letter addressed to Trump, Tom Ikeda, executive director at Densho, a Seattle-based organization dedicated to preserving Japanese-American history, wrote that Trump was “fueling a climate of fear and ignorance that promotes hate and religious prejudice.” Trump’s supporters, after all, registered majorities among those GOP voters tabulated in Iowa and South Carolina who said they didn’t oppose Japanese-American internment. Most remarkably, these numbers came in at a far higher clip than the supporters of any other GOP candidate. That racism — laden with economic anxieties of a minority population outpacing their white peers, as well as military officials looking for a “nest of spies” to scapegoat for the attack on Pearl Harbor — cost Japanese-Americans some 75 percent of their total assets, running over $3 billion in today’s dollars. More than that, though, came a four-year-long stretch — or decades-long run, depending on your perspective — questioning Japanese-Americans’ loyalty. Such questioning served as spark for the anti-Japanese immigration act of 1924, which effectively prohibited those Japanese residents in the U.S. from obtaining the citizenship toward which their Italian and Irish peers raced. But these concerns also allowed Tule Lake to become, as the National Park Service notes, “the largest and most controversial of the sites” within the entire internment and incarceration program. In 1943, myopic American officials patched together a questionnaire to gauge the loyalty of interned Japanese-Americans. Many of the questions were straightforward: age, marital status, voter registration. Within the questionnaire, however, stood a pair of queries that helped crumble the remaining faith, remaining hope, to which these Americans clung. On question No. 27, American officials demanded to know whether those interned would serve in “combat duty, wherever ordered” by Washington. Most younger men, of course, jumped at the opportunity; their willingness to serve resulted in the all-Japanese-American 442nd Regimental Combat Team, which helped carve American positions through the European theater and ended up as the most decorated unit per capita in U.S. history. (As Gen. MacArthur’s chief of intelligence later said, Japanese-American servicemen — who served in the U.S. Army at a higher rate than any other racial group — “saved over a million lives and two years.”) But for 90-year-old Japanese-American grandmothers, or 17-year-old Japanese-American children, answering “no” was no indication of disloyalty. Rather, a disavowal was a clear recognition of hard reality that they would be of little use on the front lines — a reality American officials willfully ignored when issuing the questionnaire. But the following question went even further in challenging Japanese-Americans’ loyalty. For question No. 28, American officials asked whether those interned would “swear unqualified allegiance to the United States of America and faithfully defend the United States from any or all attacks by foreign and domestic forces, and forswear any form of allegiance or obedience to the Japanese emperor, or any other foreign government, power, or organization[. ]” The question, at first blush, appears largely neutral — until you remember that American citizenship, for some 30 percent of those interned, remained unobtainable, and that disavowing links to an external nation would leave these individuals effectively stateless. Moreover, the notion of “forswear[ing]” allegiance to Tokyo presupposed some lingering affinity for a government with which Americans were at war — and a nation that many of those interned had never known. Corralled by their government, stripped of belonging and constitutional rights, the questionnaire ended up as the final insult. Japanese-Americans by the hundreds banded together, pledging to disavow both questions, becoming the “no-noes” who came to symbolize a decision not to cow to the racism robbing them of their rights. American officials couldn’t have these “no-noes” — these “disloyals,” Washington called them — corroding the remaining Japanese-American population, who were suddenly witnessing a ripple of refusal. And so, they sent them to be watched by the tanks and machine-guns of Tule Lake. In so doing, they morphed Tule Lake into the largest concentration camp America has yet known. The environs around Tule Lake — now scattered with abandoned boxcars and temporary housing for itinerant workers — saw their first ethnic cleansing in the 1870s, when the Modoc War bloodied the neighboring passes and lava fields, resulting in the only chapter of the Indian Wars in which a sitting U.S. Army general fell. Like the Japanese-Americans later uprooted and sent to Tule Lake, the remaining Modoc in the area were forcibly excommunicated to Oklahoma. However, where local restaurateurs and museums offer paeans and displays to the days of Modoc soldiery, you could pass through California’s Modoc and Siskiyou counties wholesale and never know you’d threaded the heart of America’s internment program. That remaining land — that “shrine,” as another researcher termed it — now risks a bisection, a desecration, in the pursuit of all-American capital. The local airfield, seeking to expand, is attempting to stake a new fence through the camp’s remains. According to Shimizu, they’d want it funded — like the internment camp before it — by the federal government. The Tule Lake Committee has put together a petition, noting that the fence “threatens to pave over this hallowed ground,” and that its construction could “destroy[…] the fabric of the historic site and any future possibility of preserving it.” Ina added that the plans remain in mediation; a final meeting is scheduled for this month. But the fact that such a defilement could take place — would any German official ever consider ramming a new fence through Sachsenhausen? — points to the broader realities moldering Tule Lake. Both Modoc and Siskiyou counties, where the Japanese-Americans were held, register as some of the least diverse swaths of California, coming in at nearly 90 percent white, and sit among the most economically distressed segments of the state. That is to say, these areas have proven fertile ground for the most xenophobic, most vapidly race-baiting, presidential nominee the country has seen since the days of George Wallace. Unsurprisingly, these two counties registered some of the state’s highest support for Trump during California’s GOP primary in June. And a series of recent events near Tule Lake, in an echo of policies past, hinted at the anti-minority fallout that could come under Trump. According to the Southern Poverty Law Center, members of California’s Asian-American Hmong community began registering complaints in early June about the Siskiyou County sheriff leading a sudden campaign of voter intimidation. A Hmong spokesperson told the Redding Searchlight that many residents avoided casting their ballots in California’s recent vote due to fear of arrest, with sheriff’s deputies threatening them with prosecution. As a Redding Searchlight editorial later noted, the warnings “sound[ed] like outright intimidation.” The sheriff’s actions, as ACLU California’s voting rights director later told Talking Points Memo, were “creating an increasing atmosphere of intimidation” among members of the area’s meager Asian-American population — mere miles from Tule Lake. Whether or not survivors of Japanese-American internment will mark the 75th anniversary of Roosevelt’s internment order next February under a president like Trump will be determined in two months. Until then, however, the remnants of the camp at Tule Lake will sit, blighted, barred from passers-by, now bludgeoned and buffeted by an upsurge of willful ignorance, distressingly familiar rhetoric, and ghosts no longer buried, all racing simultaneously to the surface. Nowhere, however, is there a mention of the internment camp — America’s foremost concentration camp; the Western Hemisphere’s most fortified enclave during the world’s greatest war — just down the road. The discreet temptation for a national nuclear deterrent has persisted for decades.